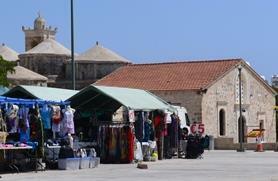 With a population of around 7,000 people Yeroskipou is the 2nd largest municipality in the Paphos District. Geroskipou also has a stadium, blue flag beach, a tennis club and the Aphrodite Water Park. Yeroskipou is an ideal spot to live, visit or purchase an investment property! Some popular attractions in Yeroskipou are the 5-domed Byzantine Church of Agia Paraskevi, the Folk Art Museum, and the numerous local pottery shops where pottery is made on site. In addition, it is known for the production of the Cypriot dessert "Loukoumia" or Cyprus Delights. It is actually the only place in the world that has a protected geographical indication for the dessert. At the moment a huge leisure project has been proposed for the coastal area of Geroskipou that would cost over 7 billion Euros. Foreign investors are negotiating the deal. Whether you are planning to buy your first home in Cyprus or sell your existing home, contact us today!